You can also read the full minute-by-minute report from Leganes vs Real Madrid in our match centre! ⚽ FULLTIME. Definitely not a bad a performance. Nothing good from it either. It's just painful to see Real Madrid lose again. Zinedine Zidane has a ton of work to do. The game seems hopeless at this point. Leganes are doing their best to keep the score and take a point from his match. Madrid can't find a way to score. Next fixture, please. 🙅‍♂️ Varane saves us from conceding the second goal! Trying to beat Leganes has become a chore. It's come to a point where it's tiring to watch. Could say 'oh look how competitive LaLiga is' but screw that... the list of mid-table or below teams we should've dispatched this season is embarrassing. 🔥 Marcelo with a killer shot! Then, Benzema attempts to score but fails to get a good strike. 🤕 Leganes scores. Thank heavens, it's an offside decision. 🙏 It's your chance, Gareth! Vamos! 😠 Marcelo tries a strike from long range but it's nowhere near. Also, Isco is off for Vazquez. 🙌 Great attempt from Benzema and Asensio! No goal, unfortunately! 😢 Come back faster, Vini! 🚅 Bale and Vazquez warming up! Maybe they can help us here? 🧤 Navas makes a relatively easy save after Leganes tries to get one up. ASENSIO gets a yellow for dissent because of a foul that should've never been given against him in the first place. 🔥 Forget the season, we have Benzema! 🙏 Now we just need a couple more! ⚽ GOOOOOAL! Big Benz, told ya! 🃏 Yellow card for Dani Carvajal. ⚽ Second time underway! Let's go out there and win! Well, Benzema just needs to score more two or more. Business as usual. ⚽ GOAL. 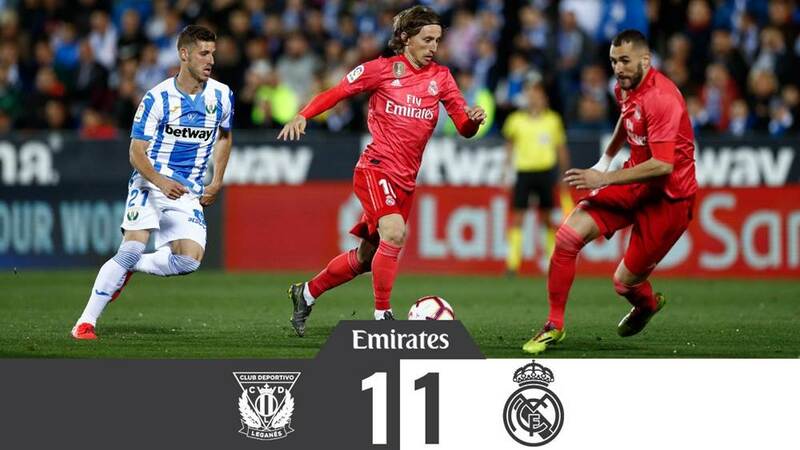 Madrid concede just before halftime. 😒 Isco attempts to score on his own but sends it too high. Well, those who don't try don't succeed. 📝 Real Madrid with 72% possession against Leganes so far, but it's still 0-0. 🤝 An equally interesting display from Leganes and Madrid so far with both teams having some chances in the first 30 minutes of the game. Valverde looks awesome while Isco-Asensio link-up is not making a lot in terms of creating dangerous situations. 😔 Another moment near our goal as Leganes take a corner and demand a penalty after Carvajal's contact with an opponent. Nothing given, move on. 😠 Hey, hands (and legs) off Casemiro! 😱 We're were dangerously close to conceding there! 🌟 Asensio aching to get his name on the scoresheet! That should've been the 0-1. ASENSIO should've done so much better, Went straight at the GK instead of either side. Poor. 🙌 An active display from both teams in the first five minutes with Madrid dominating! 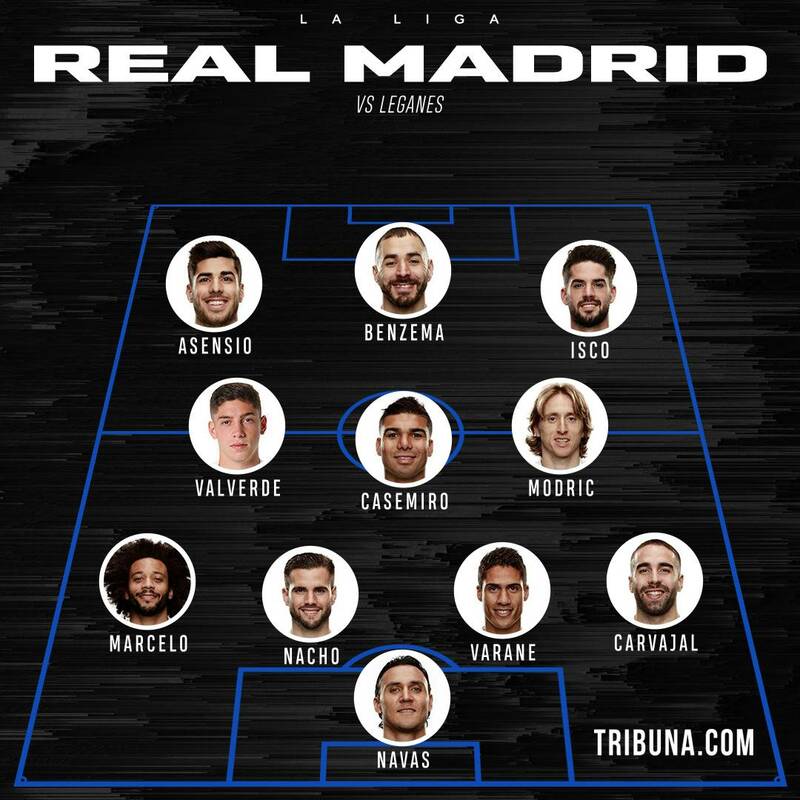 😎 Los Blancos are getting ready to start the game! 😔 Well, one more reason to dominate on the pitch today. MARCA: Leganes' Pellegrino is the only manager to have played against all 3 different Real Madrid managers this season. 🧤 The shot-stoppers are out on the pitch! 👐 Our goalkeepers are out to warm up at Butarque! 🙏 We're hoping this Monday tradition continues today! AS today helpfully supplying stat that Madrid have played 34 previous games on Monday nights - have won the last five, going back to the famous 0-5 at Camp Nou in Nov 2010. 🤔 Gareth Bale is not in the line-up and neither is Lucas Vazquez! Instead, Zidane decided to not only start Isco but put him in the right-winger position. Fede Valverde gets a chance with Toni Kroos unable to play today while Dani Carvajal is finally making a return! 🔥 Here are the eleven players that will start tonight! 💬 The starting XI will be coming in shortly - keep refreshing for updates! Los Blancos have travelled to Leganes for our next La Liga match with a 14-point gap to Barcelona and a 5-point one with Atletico Madrid with really not much at stake for the players and supporters. Nevertheless, the Whites must do their best in order to get some points and give something positive to Real Madrid fans. We're happy to see you join our LIVE match blog! We'll keep you updated on every important and interesting detail today, with reactions from media and fans!